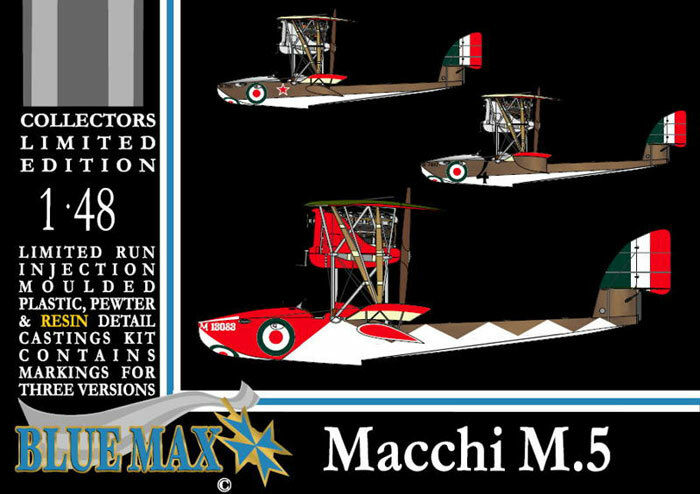 Freightdog Models are pleased to announce the imminent release of the Blue Max 1/48th scale Macchi M.5 flying boat. This is a multi-media kit including short run injection moulded main parts, resin and pewter details and screen printed decals for three options. We hope to have this item on sale at IPMS Scale Modelworld show at Telford in mid November, and will start taking order around then. Box art image is illustrated, retail price is expected to be £24.99. This is a limited edition boxing of only 300 kits worldwide. Freightdog Models would also like to announce the availability of our 1/72nd resin kit of the British Aerospace EAP under the Silver Cloud label, which is available now from our website (at £35.00), along with various recently released resin update sets. Please also check our facebook page for updates on new kit and decal projects. Thanks for looking.